HomeTravel TipsHow To Figure Out The Travel Around The World Cost? Although there is plenty of fun/joys associated with home, travel around the world can be a boosting and life-changing experience. However, you need to have the funds portion in order if you want to reduce the stresses associated with your globe-trotting desires. If you want to know how much travel around the world cost might be, we can show you how to figure it out. One of the first things that you will need to take care of is your passport. Along with that expense, you will need to calculate the cost of vaccines. Depending on where you travel, you might need none or several. After that, you will be ready to start making your plans to travel internationally. You will need to decide where to start, what countries you wish to visit along with your final destination. You might choose to make several shorter trips or one long one, based on your personal life and needs. 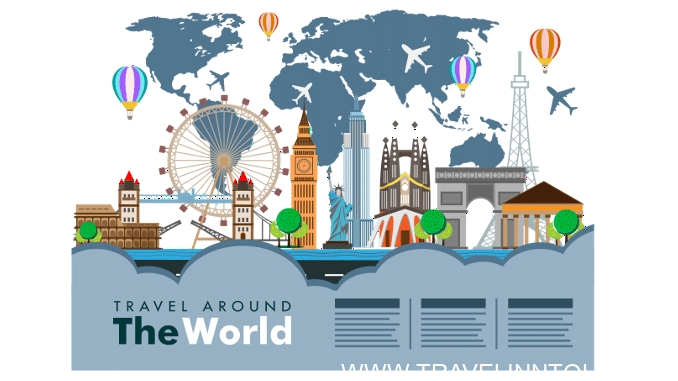 Check out travel blogs that cover the parts of the world you have an interest in seeing. What can you find regarding inexpensive travel, lodging or even entertainment? Some parts of the world have been more extensively recorded and might be easier to learn about. One of the first and often, the largest expenses associated with going to new places is the actual travel. Whether you utilize an airplane, boat or some other means, look for deals to minimize the impact of going from point A to point B on your budget. Lodging is the next big expense that you will encounter in regards to your world travel plans. However, there are ways to reduce these costs. For instance, you might stay at a hostel or other low-cost place. Consider exchanging chores for a room or other deals you might find online. If you are planning to stay anywhere besides the traditional hotel or motel, make sure that the person and situation are safe. Do some checking if needed so you can have peace of mind and a positive experience. Everyone needs to eat, even while traveling. Going to restaurants and eating out can become quite costly. Consider staying at a place where you can prepare your own meals. You can also rely on things like peanut butter and jelly sandwiches if your budget is super-limited. While you are traveling, it is likely that you will want to buy some gifts and things to remember your trip by. You will need funds for these incidental expenses along with toiletries and other unexpected items. You should also have plans for any medical expenses that might arise while you are traveling abroad. Obtain a special policy for your health coverage that will take care of you in the various countries that you plan to visit. Although traveling around the world is a fantastically exciting adventure, you will need to understand your monetary needs from the start. That way, you can plan everything. Put aside a bit extra for emergencies and the unexpected. Have a great time and enjoy the people you get to meet while you are spending time in the exotic well-traveled locations of the world! Hopefully, you can now figure out how much the travel around the world cost will be so you can figure out just how far you can go. Whether you are planning an international trip or a visit on the other side of the state, you certainly don’t want to spend more money than necessary! You can make frugal choices that don’t diminish the quality of your experience, giving yourself a bit of extra cash for the special things you really want. We have gathered some great tips if you need to be saving money on travel. Keeping your luggage to a minimum is essential if you are to save cash. Not only do you have to worry about paying extra money for transportation to and from your destination, but you also have to deal with the extra stuff when you could be enjoying your trip. From the taxi driver that helps load your baggage into the transport to your hotel to the employee who carries the luggage to and from your room, the costs for that extra suitcase will add up! Not to mention that you will spend precious vacation moments moving and using these extra items. You can either plan well in advance or look for last minute deals to get the best pricing. In between these extremes you are competing with the masses for best pricing. By making plans far in advance, you have the opportunity to secure early bird deals and combination packs that sell out quickly. The downside to that is that you will likely have hefty charges for cancellations and/or difficulties with a refund. The other extreme, last minute trips, can be risky because you might be unable to secure a good deal. However, airlines, hotels and other essential service providers would rather give a few guests a fabulous deal than leaving the spaces empty. If you have flexible scheduling, this can be a viable way to save significantly on your travel and lodging plans. You will have to eat while you are on vacation. Eat the continental breakfast at your hotel. As for lunch and dinner, look online for coupons and specials that you can utilize at local restaurants. While you will likely have easy access to discounts for tourists, you might need to dig a little further to find deals that locals prefer. When possible and practical, walk instead of using motorized transportation. This will give you the opportunity to save some cash and explore the city more closely. Take the time to appreciate the local beauty. If you are traveling with kids, make sure that you have adequate entertainment for them. Purchasing games, books and other forms of distraction at the airport and other tourist-based venues are quite expensive. Determine a budget for the trip to avoid extra spending once you get there. For instance, if you are going to buy gifts for others, write down the price range for each person or couple. Likewise, record what you will spend on yourself, including daily meals. Have fun while you are traveling and save money by employing these suggestions as you make plans. You are sure to find that the organization and planning increase your peace of mind and keeps your budget on track! Saving money on travel allows you to take more vacations each year and you will be able to see more of the world when you do.